Disclaimer: As my students know, I’ve had a crush on Hank Green for years. I will try to not let this bias my review. In the middle of the night when April May, a graphic designer, is on her way home from work in Manhattan, she’s the first person to notice a huge new statue on the sidewalk. It’s totally out of place, but she appreciates its artistry, so she calls her friend Andy and asks him to help her make a video about the statue (which she names Carl). When Andy uploads it to YouTube, it goes viral. When other Carls are discovered in other major world cities, April, the first person to report on the Carls, becomes famous and begins to relish her role as their spokesperson. Her fame opens many doors but also causes problems and, eventually, becomes dangerous. 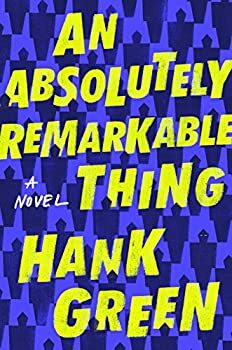 An Absolutely Remarkable Thing (2018) is a delightful science fiction story with diverse characters and a fun and clever mystery to solve. The entire world is involved in trying to find clues and piece them together to figure out what the Carls want from us. On the surface, the book appears to be about our relationship with these aliens, but it’s really about our relationships with each other. As April’s fame and social media stats rise, April becomes increasingly concerned about her brand and increasingly less likeable to the people who loved her before she was famous. By the end of the book, many readers may find themselves turning on a protagonist they initially liked. Green is asking us to think about fame and its consequences, and perhaps specifically the type of fame driven by social media and platforms such as YouTube. Related to this, An Absolutely Remarkable Thing asks us to think about discourse in our current political climate and to consider how we’ve become so polarized and where extremism comes from. Hank Green. Adorable, and so smart! I can’t help but wonder if some of April’s story is autobiographical for Green, a vlogger who became famous (along with his brother, The Fault in our Stars author John Green) on YouTube and used this fame to expand to other media including music and, now with this debut novel, literature. I mentioned earlier that I love Hank Green’s science videos, especially SciShow and Crash Course. I love his sense of humor and his precise manner of speaking. I don’t think it’s my imagination that I could hear him while reading An Absolutely Remarkable Thing. The prose sounds like him and, of course, the same sense of humor is there. I really liked this aspect of the novel. I listened to the audiobook version produced by Penguin Audio and narrated by Kristen Sieh. This was the first time I’ve listened to her and I was extremely impressed. She was perfectly cast and, I don’t know if she listened to a bunch of Hank Green’s videos before narrating his first novel, but she somehow actually sounded like him (the speech patterns, not the voice, of course). This is an excellent audiobook that I highly recommend. It’s 9.5 hours long. Oh, and Hank narrates the last chapter, which is adorable. Publication date: September 25, 2018. 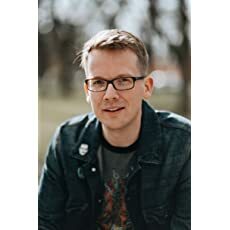 In his much-anticipated debut novel, Hank Green – co-creator of Crash Course, Vlogbrothers, and SciShow – spins a sweeping, cinematic tale about a young woman who becomes an overnight celebrity before realizing she’s part of something bigger, and stranger, than anyone could have possibly imagined. The Carls just appeared. Coming home from work at three a.m., 23-year-old April May stumbles across a giant sculpture. Delighted by its appearance and craftsmanship – like a 10-foot-tall Transformer wearing a suit of samurai armor – April and her friend Andy make a video with it, which Andy uploads to YouTube. The next day April wakes up to a viral video and a new life. News quickly spreads that there are Carls in dozens of cities around the world – everywhere from Beijing to Buenos Aires – and April, as their first documentarian, finds herself at the center of an intense international media spotlight. Now April has to deal with the pressure on her relationships, her identity, and her safety that this new position brings, all while being on the front lines of the quest to find out not just what the Carls are, but what they want from us. Compulsively entertaining and powerfully relevant, An Absolutely Remarkable Thing grapples with big themes, including how the social Internet is changing fame, rhetoric, and radicalization; how our culture deals with fear and uncertainty; and how vilification and adoration spring from the same dehumanization that follows a life in the public eye. This looks like a fun and thoughtful read. Nice to see a positive Internet success story (the author) for a change! This sounds interesting, and I’m glad you enjoyed it after being a fan of Hank Green for so long!